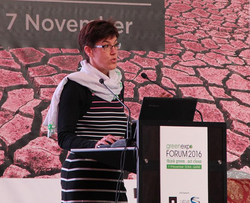 Bärbel Epp, head of solrico, spoke about „Review of International Solar Energy Support Mechanisms” at the Green Expo Forum in Qatar at the 8th of November. For the first time the Golf Organisation for Research and Development (GORD) based in Doha, Qatar, organised this international conference which was attended by around 400 stakeholders. Bärbel Epp explained market development strategies for solar heating and cooling markets and summarized key arguments for authorities to support solar thermal technology deployment.